Bacterial profiles of women's vaginas even varies between women of different races; black women tend to host a different, more diverse set of bacteria than white women. So black men had it right this entire time? The Tarantula is a sprawling star-forming region in the Large Magellanic Cloud, a small companion galaxy to our own Milky Way Galaxy. Of course, "small" is a matter of perspective; the LMC is still tens of thousands of light years across and has several billion stars in it. From its distance of 180,000 light years, the LMC appears as a smudge in the sky to the unaided eyes of southern observers. 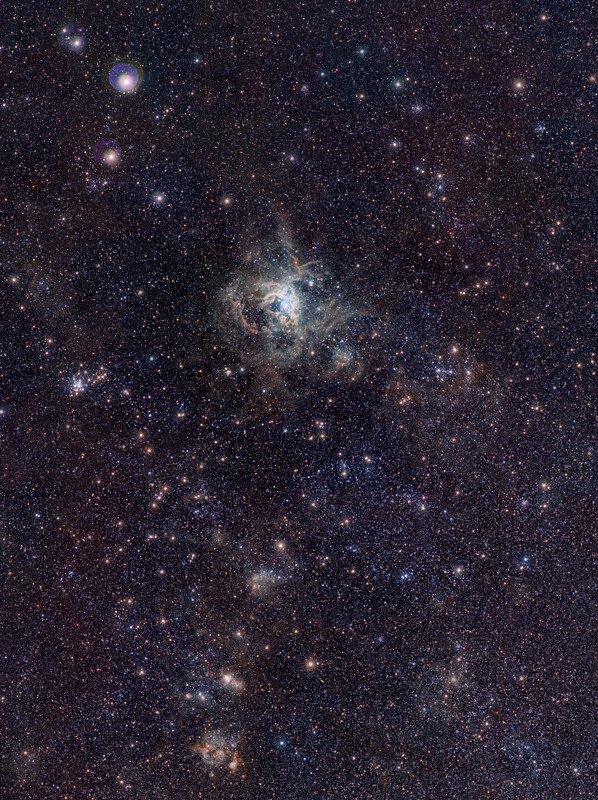 The Tarantula Nebula is a forbidding object. It’s well over 600 light years across, has millions of times the Sun’s mass worth of gas jammed into it, and is forming stars so furiously that astronomers think it may actually be creating a globular cluster, a spherical ball of hundreds of thousands of stars. You may have heard of the Orion Nebula, one of the largest and brightest of all nebulae in the Milky Way. Well, the Tarantula is thousands of times more luminous; if it were as far away as the Orion Nebula, the Tarantula would be bright enough to cast shadows on the ground! You can get lost for quite a while looking at that gigantic image... just looking at how little blackness you can see in between the stars is amazing to me. So many little dots, it's unfathomable. If you have an HDMI output on your pc, connect it to a large TV. from a certain perspective, it fits some of the criteria needed to fit as a 'science.' from my perspective, though, it doesn't come close enough. This things been jetting through space for 34 years & is just now at the edge of our solar system, the universe is big. Man. Your brain makes its own pot.... also, there's now a potential vaccine for cocaine addiction, which tricks the brain into counteracting the affect of coke so that it has no effect. Have scientists found the Higgs Boson? One of the most anticipated announcements in science could be imminent, that the Higgs boson may finally, really have been discovered, physicists say. Scientists at the Large Hadron Collider in Switzerland have been analyzing the results of particle collision experiments since tantalizing hints of the Higgs boson turned up in December. There is speculation LHC scientists will announce the discovery during the International Conference on High Energy Physics in Melbourne in July, Wired magazine reported. The Higgs boson is considered the lynchpin of the Standard Model of physics, developed in the late 20th century to describe the interactions of all known subatomic particles and forces. The Standard Model predicts many other particles, such as quarks and W bosons, each of which was found in the last four decades using enormous particle colliders, but the Higgs has eluded researchers. Physicists have been analyzing LHC data to refine the search. "The bottom line though is now clear: There's something there which looks like a Higgs is supposed to look," mathematician Peter Woit of Columbia University wrote on his blog. There are rumors of new data that would be the most compelling evidence yet for the long-sought Higgs, he wrote. The Higgs boson is critical to the Standard Model, because all the other particles are given their mass by interacting with the Higgs, physicists said. And to add to the mind-bogglingness; they're traveling at approximately 100 miles every 5 SECONDS. I thought this was cool: A working model steam engine made of glass. I've heard for years that Higgs Boson is the "God Particle" and that it would be a major breakthrough. I understand that the Standard Model predicts it, as it predicted other particles before they were discovered. But I've never heard anyone speculate on the practical applications that might come from this discovery. If we find it tomorrow, are we that much closer to a warp drive, or anti-gravity, or more efficient energy? What could we do with that knowledge? Don't get me wrong, I'm not saying that we shouldn't be pursuing knowledge for knowledge's sake. Even if it just provides more evidence that the Standard Model is correct, I'm all for it. I've just never heard anyone discuss possible practical applications of the discovery of the Higgs Boson. The bolded part is the only application we'd see for a long time as a result. It wouldn't really provide us with anything in the short term. It would provide a great deal of validation though, and would change the way physics is taught and understood. Higgs and his colleagues theorized that space itself contains a sort of charge. Elementary particles acquire mass through their interaction with the charge (you might think of this charge as a traffic camera that slows down traffic even without any actual policemen to stop the cars). Space isn’t filled with Higgs-boson particles—you need a collider such as the LHC to make those—but the Higgs boson is the telltale sign that there really is such a “charge” in space. Such a discovery won’t turn our world around tomorrow. But basic science is like that. For all the deep and fundamental truths we learn about nature, it’s rarely clear right away what the implications will be. When electricity was discovered, no one knew the globe would fairly quickly be blanketed with lightbulbs. When quantum mechanics was discovered, no one anticipated semiconductors and the ensuing electronics revolution. It’s still unclear what a discovery of the Higgs boson will mean in 10 or 20 or 100 years’ time, but cultures where people learn more about their world, and science is valued, seem to fare well in the end.